This week the ACLU of North Carolina kicked off its campaign to end cash bail . It’s an excellent companion read to this week’s edition of our Monday Numbers feature, which focuses on the causes and effects of mass incarceration. 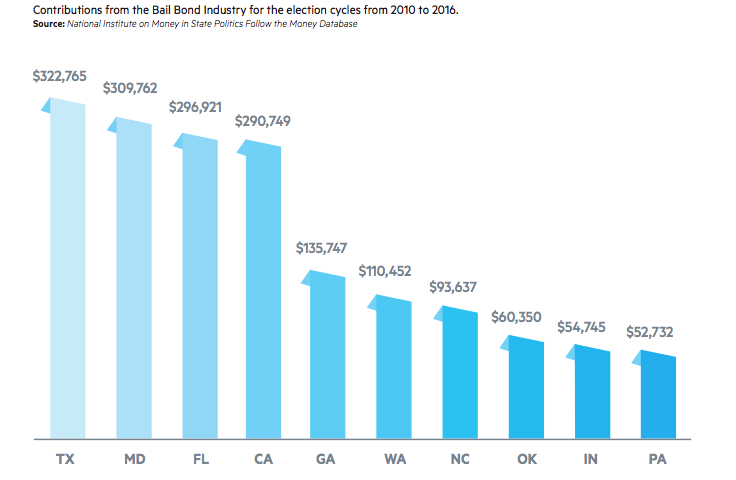 Though most political activity by bail insurers, corporations, and their associations has occurred at the state and local levels, for profit bail hasn’t ignored federal legislators. Over five years, from 2011 through 2016, the industry funded $500,000 in contributions to federal candidates or committees. In return, Representative Ted Poe (R-TX) and Senator Orrin Hatch (R-UT) have introduced a federal version of the ABC/ ALEC anti-pretrial services legislation. And congressional opposition has surfaced to fight efforts to eliminate money bail—most notably, the No Money Bail Act, introduced by Representative Ted Lieu (D-CA), which would make states with money bail systems ineligible for certain federal law enforcement funding. With a new federal administration and attorney general unlikely to challenge the constitutionality of certain money bail practices, the industry may shift its attention to influencing federal legislators and regulators to protect its profits. Does District of Columbia have a money bail system?